That’s right- a no sew, no fuss, super easy nun costume. Most of you can probably put this together with stuff you already have at home. Then throw the sleeves behind your shoulders. Nothing too hard here. You can even see that the shirt I’m using has a small logo on it- whatever! Then throw a piece of black fabric on top. I didn’t have any black fabric, so I folded a black t-shirt in half long ways and it worked just fine. Attach with bobby pins for extra wearability. And because I’m not really that cute, check out this picture! 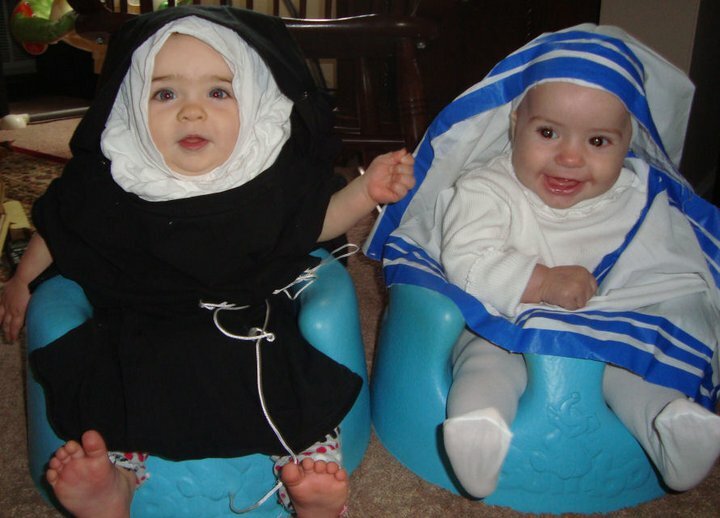 The baby on the left (a baby friend of ours) has a costume made with a very similar technique, and Violet on the right (My little sweetheart) is wearing a nun costume that I already posted directions for. this is great! 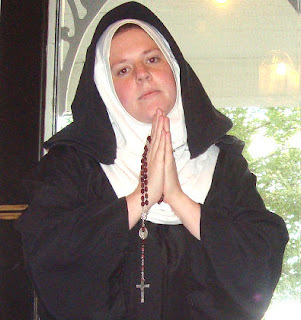 what about ideas for bishop or priest costumes? i made my husband a priest. I went to the thrift shop and bought a pair of black pants, a black button down dress shirt and a white long sleeve shirt. by adjusting the collar just so it looks like he is wearing a priest’s collar. So simple! Absolutely adorable! Thank you for sharing! I stumbled upon your blog a while back and have loved it ever since! Thank you for all the wonderful activities and ideas. Thank you for this posting. It really helped me out sooo much!!! After a week of worrying I had to hit my forhead at how simple it is. Thanks so much for posting this. My kids are begging for good All Saints Day costumes and I was not looking forward to a whole day of sewing. Your white shirt idea is going to save me. Thanks again! This is so great! I bought a graduation gown, a piece of black material and white material at the thrift shop. I couldn’t figure out how to make the white look right and I am NOT a sewer! I found your directions and I am so excited now. My husband happened to be wearing a white t shirt so i made him give me the shirt off his back to try this! thank you,this is very helpful! Thank you for the great idea of using a white tshirt for the guimpe! 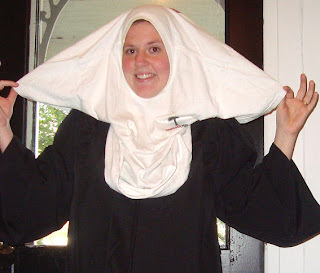 I love it and the baggy-ness of it will work perfectly for my daughter’s All Saint’s Day costume – St. Veronica Giuliani. This is great! I am trying to figure how to make a costume for my daughter. Thanks! 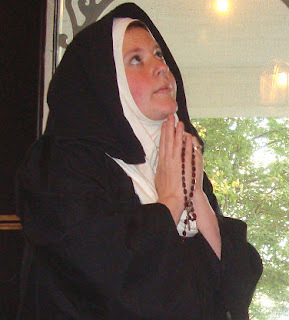 Curriculum Written by Me - Catholic ABC's! For Homeschooling, Co-op Classes, Preschool CCD, Sunday School, or even Preschool VBS! A Picture Book of the Mass, Illustrated by the Masters! $7 each or 5 for $25! Even Larger Bulk Discounts Available! Catholic Icing in the Press! 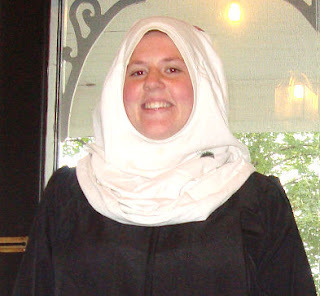 © 2009-present Lacy Rabideau. All rights reserved. Unauthorized use and/or duplication of this material without express and written permission from this blog’s author and/or owner is strictly prohibited. Excerpts and links may be used, provided that full and clear credit is given to Lacy and Catholic Icing with appropriate and specific direction to the original content. Content from this site may not be re-published in any way including (but not limited to) in church bulletins, magazines, websites, newspapers, etc. If you see images belonging to Lacy published with permission on other sites, this does not imply that you have permission to use the image as well .